This has become my favorite dessert recipe to make for company. The shell is delicate, flaky, buttery, and sweet. Working with thin phyllo sheets takes a lot of patience, but the result is well worth the effort. My only regret is not trying this recipe earlier, when I had access to the wonderful crispy apples from the farmer’s market. 1. Adjust oven rack to lower-middle position; heat oven to 475 degrees. Combine raisins and cider in small microwave-safe bowl; cover tightly with plastic wrap and microwave on high until simmering, about 1 minute. Let stand, covered, until needed. 2. Melt 1 tablespoon butter in small skillet over medium heat; when foaming subsides, add bread crumbs and cook, stirring frequently, until golden brown, about 2 minutes. Transfer bread crumbs to small bowl and set aside. 3. Drain off and discard any remaining liquid from raisins. Toss apples, raisins, bread crumbs, 1/4 cup granulated sugar, walnuts (if using), cinnamon, salt, and lemon juice in large bowl to combine. 4. Melt remaining 5 tablespoons of butter. Place sheet of parchment paper slightly larger than phyllo on work surface, long side toward you. Place phyllo sheet on parchment. Brush with melted butter and sprinkle with sugar, then place the next layer on top. 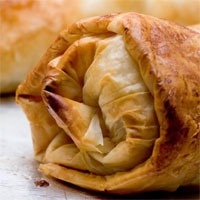 Repeat until you have 5 layers of phyllo. Arrange (about half of) the apples in a horizontal strip about 3″ wide, 2 1/2″ from the edge of the sheet closest to you and leaving about 2″ on both sides. Fold the sides of the phyllo in, over the filling. Fold the edge of the phyllo closer to you up over the filling. Roll the strudel away from you, being careful not to roll it too tightly. Place the strudel on a baking sheet, seam side down. Brush top and sides with butter. Make four slits across the top of the strudel to allow steam to escape. Bake until golden brown, 15 minutes. Cool on baking sheet on wire rack until warm, about 40 minutes. 5. Place confectioners’ sugar in metal strainer and dust strudel. Using 2 large metal spatulas, transfer strudel to platter or cutting board, cut into slices with serrated knife, and serve with Lightly Sweetened Crème Fraiche or whipped cream, if desired. Two weekends ago I set out west in search of a short foliage hike. I ended up near Cochituate State Park. The foliage was a bit past peak, but still quite colorful. 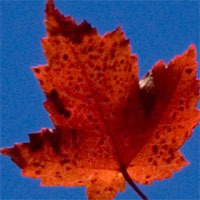 I seem to have concentrated most of my photos on individual leaves and branches. I spent a few hours yesterday afternoon playing through the first world of Zack and Wiki. It’s definitely got a kiddy-feel to it, with colorful cartoony graphics and cutesy bunny pirates (the Sea Rabbits), but the point-and-click-style puzzles are solid and immensely satisfying. Everything you need to make progress is there, usually staring you straight in the face. Using items in the game usually involves motioning with the controller, and it really draws you into the game. You can die in a variety of gruesome ways, and it’s definitely something to be avoided because you’ll need to restart from the beginning of a stage or be charged a ticket to continue from the point at which you died. Definitely makes you think twice about trying stuff carelessly. If you are a fan of old Sierra and LucasArts adventure games, Zack and Wiki is well worth checking out. As the temperatures outside have been dropping, I’ve been able to go back to cooking with my Dutch oven (it just doesn’t feel right to use it during the summer). Was thinking about making a stew when this pot roast caught my eye. It was amazingly good, and (not surprisingly) kept well for a few days. The last bits of it made it into a cold sandwich and even in that state is was tender. Would definitely make this one again – the sauce, enriched by a bottle of wine and gelatin, is very tasty. 2. Meanwhile, bring wine to simmer in large saucepan over medium-high heat. Cook until reduced to 2 cups, about 15 minutes. Using kitchen twine, tie parsley sprigs, thyme sprigs, and bay leaves into bundle. 4. Adjust oven rack to lower-middle position and heat to 300 degrees. Cook bacon in large Dutch oven over medium-high heat, stirring occasionally, until crisp, 6-8 minutes. Using slotted spoon, transfer bacon to paper towel-lined plate and reserve. Pour off all but 2 tablespoons fat; return Dutch oven to medium-high heat and heat until fat begins to smoke. Add beef to pot and brown on all sides, 8-10 minutes total. Transfer beef to large plate and set aside. 5. Reduce heat to medium; add onion and cook, stirring occasionally, until beginning to soften, 2-4 minutes. Add garlic, flour, and reserved bacon; cook, stirring constantly, until fragrant, about 30 seconds. Add reduced wine, broth, and herb bundle, scraping bottom of pan with wooden spoon to loosen browned bits. Return roast and any accumulated juices to pot; increase heat to high and bring liquid to simmer, then place large sheet of foil over pot and cover tightly with lid. Set pot in oven and cook, using tongs to turn beef every hour, until dinner fork flips in and out of meat, 2 1/2 to 3 hours, adding carrots to pot after 2 hours. 6. While meat cooks, bring pearl onions, butter, sugar, and 1/2 cup water to boil in large skillet over medium-high heat. Reduce heat to medium, cover, and cook until onions are tender, 5-8 minutes. Uncover, increase heat to medium-high, and cook until all liquid evaporates, 3-4 minutes. Add mushrooms and 1/4 teaspoon table salt; cook, stirring occasionally, until vegetables are browned and glazed, 8-12 minutes. Remove from heat and set aside. Place 1/4 cup cold water in small bowl and sprinkle gelatin on top. 7. Transfer beef to cutting board; tent with foil to keep warm. 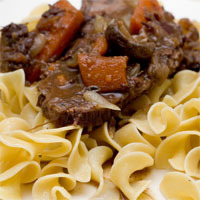 Allow braising liquid to settle about 5 minutes; then, using wide, shallow spoon, skim fat off surface. Remove herb bundle and stir in onion-mushroom mixture. Bring liquid to simmer over medium-high heat and cook until mixture is slightly thickened and reduced to 3 1/4 cups, 20-30 minutes. Season sauce with salt and pepper. Add softened gelatin and stir until completely dissolved. Our radio-frequency controlled clock knows when to fall back, as do my cell phone and computer. 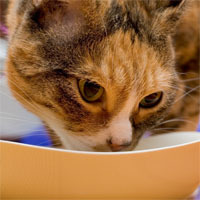 No such luck with hungry cats. Sheamus and Annabelle have been visiting for the past two weeks and have been up to their old tricks – chasing each other around the house, sleeping on the ottoman, jumping all over the kitchen counters, and playing with our guests. A few weeks ago, Guinness came to visit. We were surprised by his girth, but eventually got used to his size. He was quite a character. Over the past year, our Wii didn’t see nearly enough action to justify the 430am Black Friday trek that I made to acquire it. After beating Zelda there wasn’t a whole lot to get excited about. Fortunately, that’s changed over the past few months (Metroid, Guitar Hero) and there’s a lot to look forward to (Mario Galaxy, Mario Kart, Smash Bros.). One game that’s pretty much guaranteed to be a huge sales failure is Zack and Wiki. 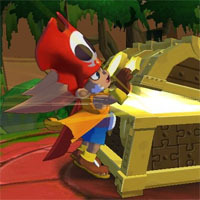 Cursed with unrecognizable characters and cheesy cover art, the game has been well-received by reviewers, who are excited about its challenging puzzle-oriented gameplay and great use of the controller. I’ve decided to pick up a copy of the game in support of Capcom because it’s a shame that creativity is not generally rewarded by the gaming public. I’m looking forward to playing it over the next few months.